Adverse winter conditions around the country did not seriously hold dairy farmers back after excellent weather through autumn provided a solid base of ample feed. North Island feeder calf sales reported strong demand for good four-day-old Friesian feeder calves and beef cross types. Prices paid for these depended on the breed and quality of the calf, though up to $250 per head was a benchmark as the season commenced in the north. As the supply of stock increased, values eased, though demand for feeder calves continued. 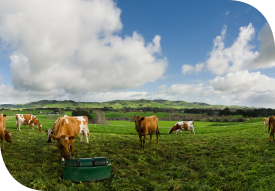 Dairy farmers seized opportunities presented by the beef industry. Acquiring four-day-old calves and taking them through to 100 kilograms presents an excellent entry point for those diversifying into the strong beef sector, which influenced decisions ahead of mating. Export returns indicate the value of some classes is set to significantly exceed last season. Although calving is still in process, farmers are thinking about continuing the cycle next season, and taking advantage of the excellent returns indicated for beef. Utilising well selected beef bulls over a dairy herd can deliver many benefits, including increased profit and production. Using quality recorded, high genetic merit Angus and Hereford bulls, instead of unrecorded, inferior bulls, is an option that many farmers are considering. PGG Wrightson’s ‘Defer-A-Bull’ initiative provides a deferred payment option for farmers to invest in these higher value bulls, or similarly can be used to purchase more traditional dairy service bulls. Meanwhile, the surplus feed situation early in the winter was a positive factor for sheep and beef farmers, particularly with sales of lamb and sheep meat strong. North Island prices for sheep are a big improvement on 2016, at over $1 per kilogram ahead of where they were this time last year. South Island lamb schedules sat around $6.50 to $6.60 per kilogram, a dramatic turnaround compared to what meat processors indicated earlier in the year. These values appear sustainable, as the outlook for sheep looks bright in all regards, apart from returns for strong wool, which is still struggling. Increased market activity into China, where excellent demand for mutton is evident, sends positive signals. Some mutton is now being further processed before shipping, and these added value products have helped improve farm gate returns. Scanning results are promising and barring adverse weather events, spring should be a season of good news for sheep farmers. Meanwhile, the trade in livestock suggests the situation for cattle farmers is also positive, though with a few caveats. Cattle have been more seriously affected by the conditions being so wet, which has tightened up the feed supply. Many farmers found themselves working in the mud, and feed surpluses created by the mild autumn were largely used up as winter drew on. South Island cattle prices have started to ease due to overseas markets and stronger exchange rates. Local trades, especially in prime cattle, drove prices to between $5.70 and $5.80 per kilogram. In some instances cull cows made up to $4.40 per kilogram, though that is based on very limited numbers of sales. Although local market demand for cattle was strong and prices remained positive, downward pressure from overseas markets mean cattle values are unlikely to rise significantly in the short term. This report was prepared in consultation with PGG Wrightson's Livestock Team.